At the Council of Tours in 1163 the Church forbade physicians to practise surgery. Because many physicians were men of the cloth, surgery fast became a paramedical, then an extramedical, pursuit. In Germany and northern France, quacks and charlatans of all kinds recognized the potential market and quickly added surgical services to miracle cures and the pulling of teeth at country fairs. The principal acts performed were the removal of clouded lenses and of bladder stones, true or virtual. It was evidently not good even for an itinerant healer to lose too many patients, and some of the procedures need not be considered primitive. Immense bladder calculi were removed, from the 16th century on, through sectio alta, that is, a horizontal cut just above the symphysis. An incision through the perineum, recommended by Ambroise Pare, was avoided because of the increased risk of infection. The prudent operator had the patient drink a lot of water before-hand, to make sure the intestines were pushed up and out of the way. Figure 1. 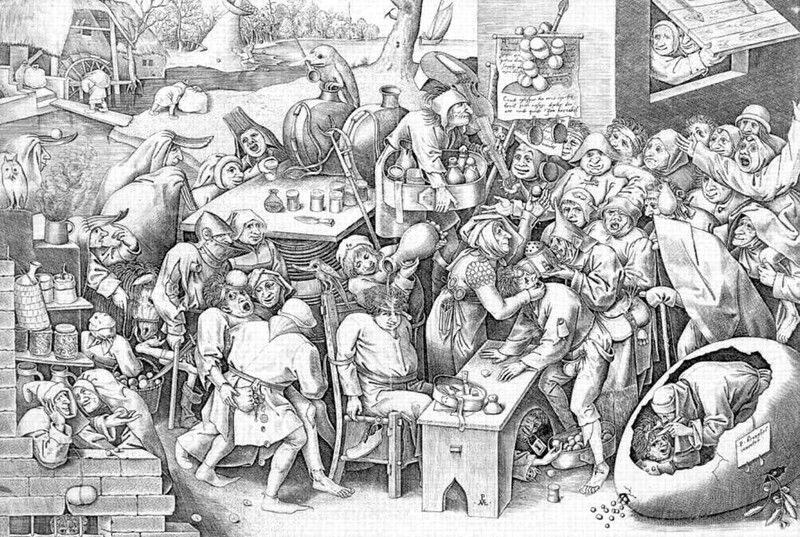 Engraving by Pieter van der Heijden after Pieter Brueghel's De heks van Mallegem. The witch of Mallegem comes to the country fair to be cured of the buzzing in her ears (the "wasp in her head"). Meester Ian, the "doctor," shows a stone he pretends to have removed from the head of the patient leaning on the bench in front of him. In the collection of the Rijksmuseum-Stichting, Amsterdam, The Netherlands.